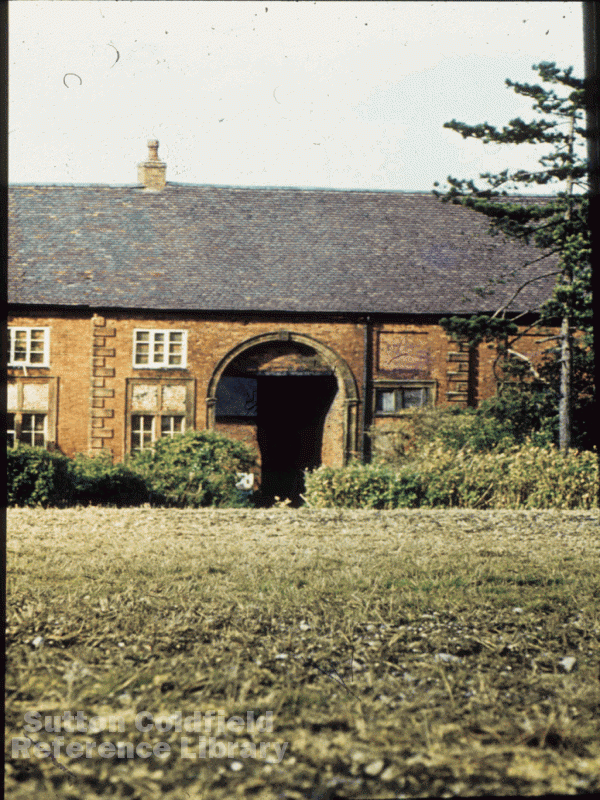 On a hillside off Ox Leys Road, overlooking the Falcon Lodge Estate, stands a block of apartments, the former stables and outbuildings of Langley Hall. Langley Hall itself was demolished in the 1820s, leaving only part of a moat and some uneven ground to be seen at the site today. The Warwickshire historian Sir William Dugdale, writing in 1656 when he had access to many ancient records which do not now survive, found the first documentary evidence for Langley in a deed of 1253, in which Walter de Bereford grants to Walter his son 50 acres at Lonkeley Blackmore and Brockhurst in Sutton. Dugdale presumably did not have access to the Beauchamp Cartulary in Warwick Castle, (published by the Pipe Roll Society in 1980), which contains a copy of a quitclaim of 1240. This 1240 document refers to assarting, the bringing of new land into cultivation, some of it done by the De Berefords of Langley - Simon, Walter and William are mentioned, possibly three generations taking us back to the twelfth century. The assarts lay between Ox Leys Road and Bulls Lane - these roads are described as “the two great roads leading towards Langley”, and a map of 1824 shows that these two roads were then over 100 feet wide. Assuming that Langley Hall was built in the twelfth century on land granted by the Earl of Warwick (Lord of the Manor of Sutton and the possessor of Sutton Chase) in the midst of wild country, the Lord of Langley would have made these approach roads wide enough to make it difficult for enemies or outlaws to ambush him in those lawless times. There was much unrest at the end of King Henry III’s reign, so when his son King Edward I returned from crusade to be crowned in 1274, he dismissed all the sheriffs and appointed new sheriffs - his own men - to restore law and order and settle disputes. Osbert de Beresford of Langley Hall was appointed Sheriff of Warwickshire and Leicestershire, so he may have been with Edward on his crusade, possibly in the Earl of Warwick’s party. William, Osbert’s brother, succeeded him in 1288. He was a knight, but as well as giving military service to Edward I in his numerous wars, he was a lawyer, created Chief Justice of the Common Pleas in 1309 (third highest judge in the land), which he held until his death in 1326. He was already a prominent judge in 1294, when Roger Brabazon and William de Bereford were commissioned to recruit criminals for the Gascony campaign - it was said that there were many men accused of crimes “who wander about the countryside doing, procuring and committing many evil deeds” King Edward was “moved to pity for that so many and divers men of our kingdom so often incur the penalty of life and limb”. Gascony, also known as Acquitaine, centred on Bordeaux, was the last French province ruled by the English crown at the time, and was being attacked by King Philip IV of France. The difficulty of trying to enforce the law is shown by the way John de Somery (nicknamed the Robber Baron) was able to appeal to Edward II over de Bereford’s head, accusing him of defamation -William had said he”so domineered in Staffordshire that no man could enjoy benefit of law or reason, taking upon him more authority than the King as also that it was no abiding any thereabouts unless they did bribe him in contributing largely towards the building of his castle (at Dudley). And moreover that the said John did use to beset mens houses in that country, threatening to murther them except they gave him what he would demand”. In 1327 Edward De Bereford, aged 28, inherited Langley; in the same year Thomas de Beauchamp succeeded to the Earldom of Warwick, King Edward II was murdered and Edward III came to the throne. Edward de Bereford obtained licence to fortify his manor house at Langley with a wall of lime and stone, and to embattle it, but this was not done. He died in 1355, succeeded by John, who died in Gascony in 1357. This Gascony campaign was led by Edward the Black Prince, victor along with the Earl of Warwick at the Battle of Poitiers in 1356, so perhaps John died fighting. John’s brother Baldwin succeeded him at Langley, aged 27 - he had also been in the service of the Black Prince and would have risen to high office under the Black Prince’s son King Richard II had John of Gaunt not thrown out the king’s household as “bad advisers”. Baldwin, the last of the de Berefords, died in 1417.